Judges, part of the Deuteronic history of books within the Hebrew Bible includes Joshua, 1 & 2 Samuel, Deuteronomy and was first put to papyrus around 550 CE during the Babylonian Exile. It is more than just the (in)famous tale of Samson and his hair, but includes many other judges from Deborah (ah the war hammer) to Gideon. The stories cover the time period between the end of Joshua and the establishment of the Kingdom in the books of Samuel. It, as with other Deuteronic history stories, ties the hearer back to the covenant made with the Holy Mystery. Now, the modern reader has to remember that Deuteronomy was “discovered” in the newly re-established temple under Ezra, it was a refined look of the whole Torah (Pentateuch) and gave us the redacted 10 Commandments that shifted the No God command from no God before me, to NO GOD but me. It is not a unique cycle in the course of lifespan development. Think of our own journey in adolescences with our parents or mentors. Those times we would attempt to step out of the protection of the safe place for us (for some the home, others had other places). 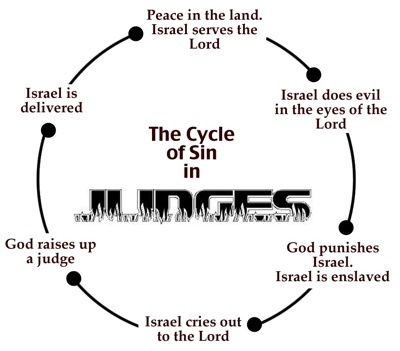 The book of Judges breaks it down to sin language, but truly it is attempting assertion of self, and knowing what options are available. In the world of problem solving I would call it a POP strategy. The people come to a crossroads/problem. They look at options, they pick an option, and move forward with the Plan (P.O.P=Problem, Option, Plan). What happens though is that the option chosen is not healthy for the individual or the community, they run back to the source and plead for help in the conundrum, a judge rises and aids the solution. Metaphysically this is the interior castle moments when we know we have pooched it, we turn back to the divine within, with help of our mentors (like in adolescence when you would work out a P.O.P. unofficially with a parent or trusted adult). In our teens, my brother and I termed it the walk of shame, going back to Dad or Mum after our plan blew up in our faces, to let them know they were right and needing to get back on track. That is the judge (not like the Judges Moses commissioned, rather they are spirit guides or in some cases, like super heroes). The new plan is laid out, followed through, and the nation/person is back on track. In the point in time in history the stories were used to show how to avoid another exile, and what had led to exiles. For a personal reflection as we journey through it will be looking at our own times of disconnect and exile. Those times when we have fed the wrong wolf inside us, and the darkness is a bit stronger, what this means for our own personal judges being raised up to guide us back into our light and true self. For the P.O.P. stratagem awaits…what are your options? Why is it so hard to bring community youth into the church? It’s not like there’s a stigma–there is no more razzing for attending church than doing anything else in your teens. So what is it about the church that scares young people away? In my years of youth ministry I’ve discovered the church can be its own worst enemy when it comes to taking the Gospel to the street. Recently, I went to a local Starbucks to do some reading and ended up chatting with different teens I’ve seen around the ‘hood. Some were former youth of mine and some were street kids. I asked why they won’t come into church. The resounding answer was that they were unwanted. These kids immediately felt unwelcome when they entered different churches. As a teenager, I remember showing up to a youth group with friends one night and being informed I was going to hell. I was told never to come back. At another church, my friend was advised not to bother bringing an outsider like me to the meetings. The churches by our high school, it seemed, spent more time chasing us off than talking to us. Even as a youth pastor, I’ve fought to keep a teen in youth group when the church wanted him out because he lived in a group home. I was shocked by the response of one girl I talked to: “I can’t afford church.” Her local church charges for youth group. It’s an often overlooked problem: church is overpriced for some teens. These kids wanted to go to church but, as they explained, they felt they didn’t belong. “I smoke,” they said. “I drink and do drugs. The door was locked when I went? That comment struck me deeply. Churches, literally locked up tight, live in fear of property vandalism. But those dead bolts aren’t the only thing acting as locks on the Kingdom of God. All of those reasons kids gave for not attending church are barring the doors. Because you are pierced/gay/tattooed/illiterate, you aren’t allowed inside. You won’t be accepted. Every night I pray for an opportunity to reach out to the community. I know, in theory, that God wants that to happen. And it’s a great theory until you add real human beings to the mix. Then the theory doesn’t always hold. I am optimistic every once in a while. When I wonder if my church will go outwards, I look at my city–my neighbourhood alone has close to thirty churches. When my friends talk about the violence around us and question why God doesn’t do anything, I feel He is doing something. We’re here–the generation that turned away from the church in our own youth and then turned back. Now the question is: are we willing to help these kids or are we just going to keep the doors locked? As I said, I’m hopeful. One day, I will see churches brimming with youth that would normally be on the streets–hurting, running and trying to find whatever they can to fill the void. One day, there will no longer be doubts about acceptance in church. One day, the doors will be unlocked. COPYRIGHT 2004 Presbyterian Record No portion of this article can be reproduced without the express written permission from the copyright holder.